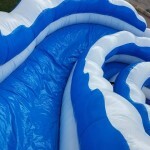 The Blue Curve Water Slide, this large slide is completely inflated this allows for hard surface set ups. Kids, teenagers, and all will enjoy this water slide. Call Lena Today 972-539-5867 same day rentals we endeavor to accommodate. Jump City delivers to Plano, Dallas, Frisco, and all cities in between.